Papal Bull « Of the foundations of the Church of God ». Article 1 : The Aristotelian Church is the One, Unique Self and Institution of the Almighty. Article 2 : The Aristotelian Church is the only holder of the Divine Truth and the True Faith. It is inhabited by the divine action and is the organ by which is expressed on Earth and to the community of the faithful the will of the Almighty. Article 3 : The Aristotelian Church derives its name from the prophet Aristotle, who was the first to reveal the divine truth. It was established by Christos. Article 4 : As a universal and divine spiritual institution, its mission consist of spreading Aristotelianism to peoples and nations for guiding them on the path to the Solar Paradise. Article 5 : There is no other prophet outside Aristotle and Christos. The symbiosis of their revelation of the divine message is perfect and immutable. Their message is complementary and indispensable to the understanding of others and the Aristotelian faith . Article 6 : The Aristotelian Church Dogma is founded on texts from the books and represent the core of the inalienable and necessary beliefs. N.B. : We understand as "text from the books" those contained in the Book of Virtues, and the doctrinal texts and writings of the Saints. Article 7 : Only an extraordinary council, bringing together all the bishops of Aristotelianism, can challenge, modify or refine a dogma. Article 8 : The Book of Virtues brings together the books of the Aristotelian Myth, the Vitae of Aristotle and Christos and of the Archangels. These are sacred texts and forms the basis of the Aristotelian religion. Their value is dogmatic. Article 9 : The Aristotelian Church Doctrines form the frame of the Aristotelian belief. Enacted by the theologians and doctors of the Church, they have dogmatic value. Article 10 : The writings of the saints provide a framework for the doctrines of the Aristotelian Church. These are the teachings of our predecessors in the faith, who lived the Aristotelian virtues in a heroic manner in ever greater intimacy with God. They are the living and constantly renewed tradition of the church, illuminating the sacred mysteries revealed by the prophets. Article 11 : The Book of Hagiography is a codex of historical biographies of the saints who's vocation is to serve in the spiritual and social elevation of the world through the example of many lives who testified to the Sun heroically in their faith and virtues in their own time. Article 12 : Every human being a child of God, no segregation based on criteria other than faith, virtue and merit should take place within the Aristotelian Church. Article 13 : A Blessed One is a dead Aristotelian beatified by the Holy Church in relation to its past life, exemplary and virtuous, worthy of being a social and spiritual example to the Aristotelian. 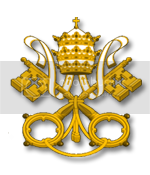 - Article 13 bis : The rules and procedures leading to the beatification are included in the Canon Law of the Congregation for the Cause of Saints. Article 14 : A Saint is a Blessed One canonized by the Holy Church in relation to its past life, even more exemplary and more virtuous, than the Blessed One's, and deserving of being such a social and spiritual example to the Aristotelian Community. Article 15 : The Fathers of the Church are the founders of the Church Aristotelian in its infancy and at time of the Renewal of the Faith under the pontificates of Blessed Father Nicolas V and Eugene V.
Article 16 : The Doctors of the Church are eminent theologians or canonists who have produced or worked on doctrinal, dogmatic or canonical texts of universal significance. Article 17 : Heterodoxy is an action contrary to the Aristotelian Dogmas, to the doctrines laid down in Canon Law of the Holy Church, damaging to the community of believers and to the holy institution of God, by the induction of error in the mind of the children of the Most High. Article 18 : The heterodoxies are four types: heresy, schism, paganism and atheism. Article 19 : The heterodoxies are trialled by the Holy Inquisition in the limits assigned to itself. Article 20 : The Aristotelian Church makes a distinction between two kinds of charges, status and activities of its members. These differences of nature may be In Gratebus [/ i] (The Graces) or [i] Res parendo [/ i] (Things that appear). [i]- Article 20 bis : The nature In Gratebus regroups things that exists by the Grace of the Creator. The correct abbreviation employed in the Canon Law is IG. - Article 20 ter : The nature Res Parendo regroups things who appear by themselves while still taking source in the Creation. The correct abbreviation employed in the Canon Law is RP. (1) The Book of Virtues which is available under the Library in Rome is not complete because it is a translation. The original text is stored in the secret archives of Rome, the theologians of the Congregation for the Cause of Saints are working to finish his translation. First published by the late His Eminence Jeandalf the eleventh of February, the Sunday, of the year MCDLV; reviewed, stamped and re-released by His Eminence Aaron de Nagan, Cardinal Camerlengo, the thirteenth day of April, Easter Monday, the year of grace MCDLVII.